Islamabad: In yet another provocative move, Pakistan Foreign Minister Shah Mahmood Qureshi spoke to hardline Hurriyat Conference chairman Syed Ali Shah Geelani and discussed the Kashmir issue, the Foreign Office said here on Sunday, days after he made a similar phone call to a separatist leader that angered India. The Foreign Office in a statement said that Qureshi and Geelani discussed about an international conference to be held in London to “express solidarity with the Kashmiri people”. 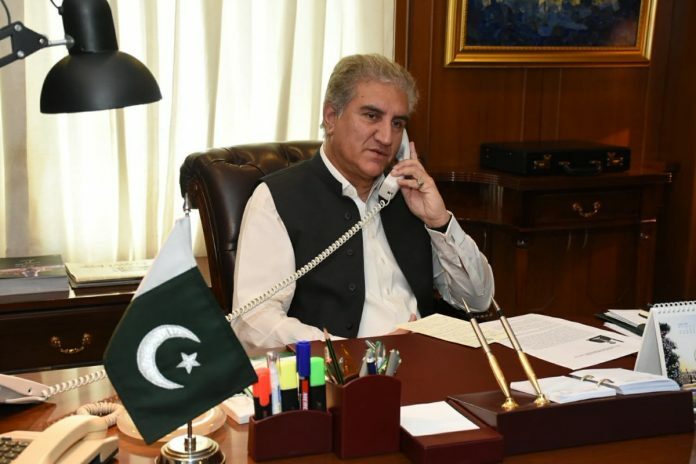 “Foreign Minister Qureshi spoke to the senior leadership of the All Parties Hurriyat Conference on telephone before his departure for London to attend international activities to be held there in connection with the Kashmir Day, the statement said. Qureshi on Tuesday telephoned Hurriyat leader Mirwaiz Umar Farooq and discussed with him Islamabad’s efforts to highlight the Kashmir issue. India Wednesday summoned Pakistan envoy Sohail Mahmood and categorically told him that Qureshi’s telephonic conversation with Mirwaiz was a “brazen attempt” to subvert India’s unity and violate its sovereignty and territorial integrity. India said that Qureshi’s telephonic conversation with a separatist leader reflected the duplicity in Pakistani leadership’s approach on ties with India. The Pakistan Foreign Office on Sunday said Qureshi exchanged views with Geelani about the programmes to be held in London. The foreign minister will speak at the International Kashmir Conference at the British Parliament on Monday. On Tuesday he will also attend the exhibition at the Park Lane in connection with the Kashmir Day, it said. Talking to media in Multan on Saturday, Qureshi said Pakistan has no intention to interfere in India’s internal matters and New Delhi should not make an issue out of his telephonic conversation with Kashmiri separatist leader Mirwaiz. Qureshi said that Pakistan has no intention to interfere in the internal matters of India, but New Delhi should also stop blaming Islamabad for its problems. “We want to resolve the Kashmir dispute through dialogue but India is making undue hue and cry,” Qureshi said. “Issues are emerging in India but Pakistan has no role in that,” he said. Qureshi said that he would highlight Pakistan’s view point on Kashmir issue at an event in the House of Common in London this week. The Foreign Office also issued Qureshi’s statement before his departure to London in which he was quoted as saying that Kashmir is an “important pillar” of Pakistan’s foreign policy. Pakistan will continue its support for the oppressed Kashmiris on political, moral and foreign levels and want resolution of the Kashmir dispute in accordance with the UN resolution, he said. India gets annoyed if the Kashmir issue is highlighted despite the fact that it is a resolvable issue. The real face of India would be exposed by presenting Pakistan’s point of view on the issue in the international conference being held on Kashmir in London at the House of Commons, he said. He said regardless of the political party winning the next election in India, Pakistan would reciprocate to the new government’s good gesture in New Delhi.